In previous posts, we talked about running skyDNS and Heapster on your Kubernetes cluster. In this post, I want to talk about the last of the cluster ‘addons’ available today in the Kubernetes repository. 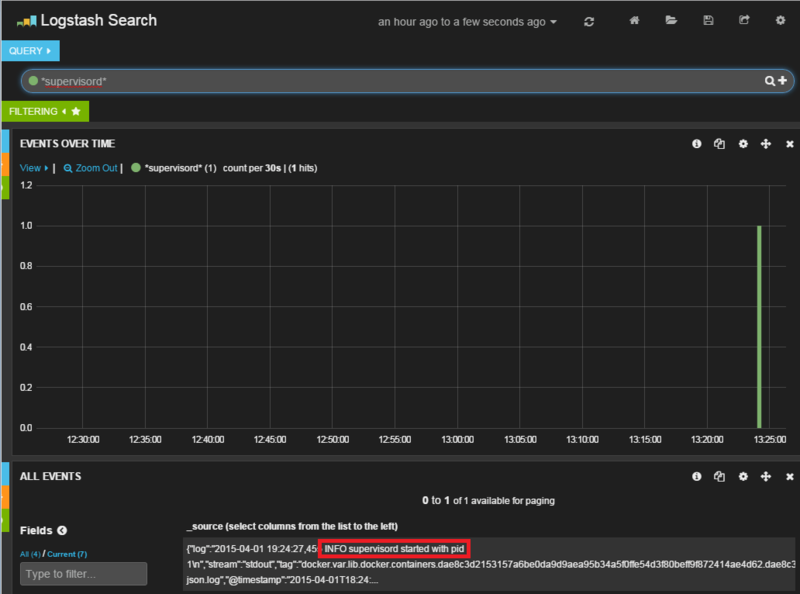 This add on is a combination of Fluentd, Elasticsearch, and Kibana that makes a pretty powerful logging aggregation system on top of your Kubernetes cluster. One of the major struggles with any large deployment is logging. Having a central place to aggregate logs makes troubleshooting and analysis considerably easier to do. That being said, let’s jump right into the configuration. Note: I have an open PR on this addon to make it a little more flexible from a configuration perspective. Namely, I want to be able to specify the port and protocol used by the API server to access the backend service when using the API server as a service proxy. That being said, some of my pod/controller definitions will be different from what you see on GitHub. I’ll point out the differences below when we come across them. The PR got merged! We still need to slightly tweak the controller definition but other than that it should be identical to what you see out on the official repo. More info on the tweaks below when we talk about the controller definition, see ‘Note v2:’. Note: If you’re going off of my saltstack repo for my lab build this is entire build is already integrated for you. Easy enough. 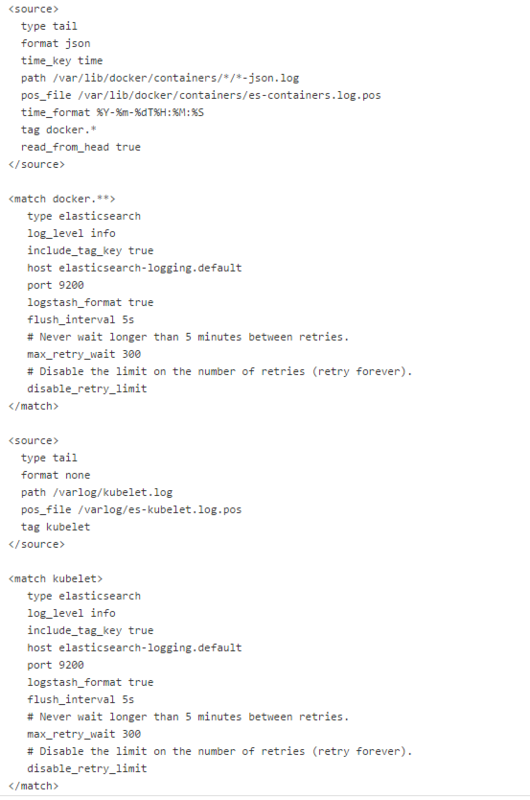 So all of the Fluent containers will send the their logs to this ElasticSearch pod. 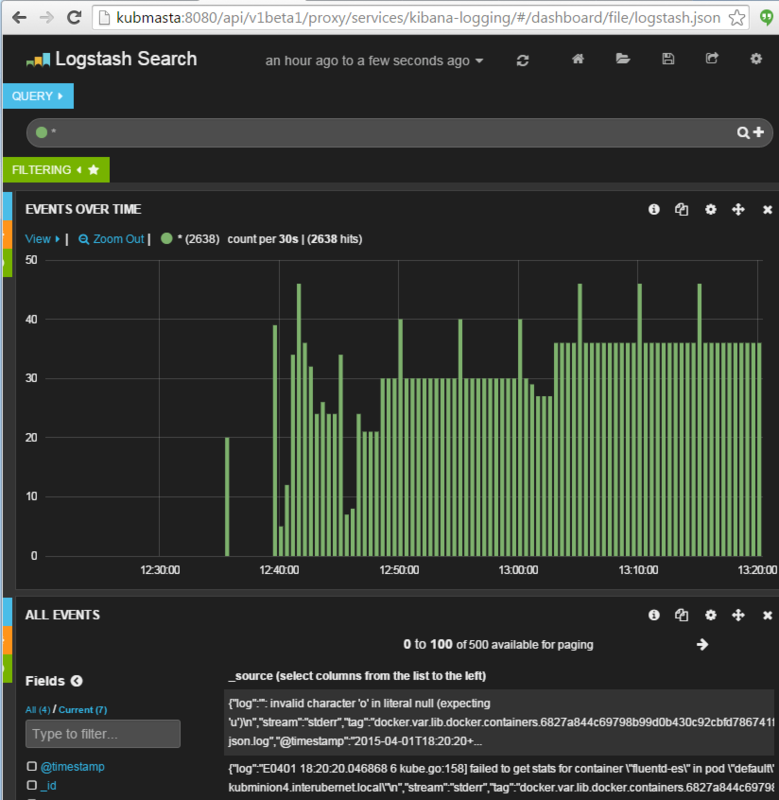 The next step is to create a Kibana frontend so that we can view and search the logs. Let’s define that.. Note: This is where the changes I made in my PR come into play. I needed a way to tell the pod what port and protocol to use on the API server. The definition from GitHub assumes you’re running the API server on port 443 and doesn’t allow you to configure this service to be accessed over another port or protocol. I added in the ENV variable section and also rebuilt the Docker image to take the new variables into account. Note v2: The above note is still accurate, but please note that this is now the official controller definition from the Kubernetes project. The only tweaks made were changing the SCHEME to ‘http’ and inserting the ‘:8080’ since that’s what my API server is listening on. The official image also got updated so you don’t need to use my any more. Note: You NEED the trailing slash in the URL!!! Awesome! So it’s working as expected. So as you can see, this would be a pretty handy tool to have as your cluster continues to grow. Some pretty awesome open source logging functionality here. Any setup instructions for bare metal ubuntu cluster? I saw your comment here and I think that you asked in another place too. 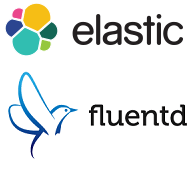 You can bring up a pod (as a RC if you wish) of fluentd,as in cluster/saltbase/salt/fluentd-es/fluentd-es.yaml and that should work. Adding a persistent volume might be a good idea too. It tries to reach https://10.254.0.1:443, and my api serve works only on 8080. Newbie to fluentd. Can you explain how the tag docker. * in source is use to match docker. **, and why use es-containers.log for pos_file?